According to WSB-TV in Atlanta, over 1500 workers are currently on site working on the $1.4 billion dollar Mercedes-Benz Stadium - the new home for the Atlanta Falcons. The new stadium is said to be setting "a new standard for multi-purpose stadium design, taking the fan and guest experience to new heights for football, soccer and other sports and non-sports events," according to AJC.com. But that's not all. In an effort to outdo itself when it comes to environmental sustainability, the Mercedes-Benz stadium is striving to reach LEED Platinum certification, which would make it the first professional sports venue to achieve this level of certification for building construction and operations. The challenge at the time was that there was no infrastructure in Atlanta for managing bales of recyclables. The pilot was put in place to determine whether a baler and the increased labor needed for on-site preparation would address their goal to "maintain maximum material value with minimal energy expended." This is where Orwak North America stepped in. It was quickly determined that Orwak's multi-chamber balers were the logical choice for the pilot because they could handle common recycling materials generated i.e. plastic film, PET, aluminum and mixed paper. "Orwak's multi-chamber balers are designed to facilitate sorting and compacting different types of materials at the source. Although they come with two chambers, they can easily expand to multiple chambers creating an on-site recycling station," states Mark Lanning, Senior Vice President for Orwak North America. The Orwak's multi-chamber baler system was put in place at the Dome in time for the August 23 pre-season game. The primary goal for the August 23rd game was to bale enough aluminum and mixed paper for UNICOR, an Atlanta Recycling Center, to make two to three standard mill size bales, then calculate the labor required to sort mixed material bags and make mini-bales. If the outcome achieved it's recycling and financial goals, the program would be expanded. "We believe the Orwak multi-chamber balers are a great fit for the Mercedes-Benz Stadium, " stated Mark Lanning. "We have seen great success with dual chamber balers at the Georgia Dome and the Metlife Stadium in New Jersey. 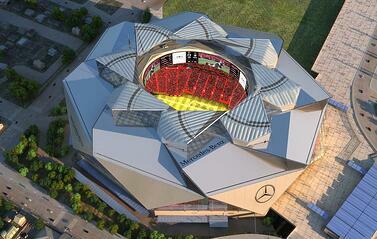 Our hope is that when the Mercedes-Benz Stadium opens in June 2017, Orwak balers will be there." 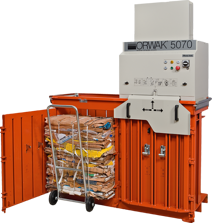 For more information about Orwak's full product line of cardboard, plastic,aluminum, mixed waste, hazardous waste and dual chamber compactors and vertical balers, download our catalog today.